Description: Following the events of Forever Evil, Superman confronts Lex Luthor - but the world has turned around for these two. 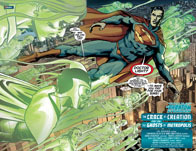 The hero has become the villain and the villain the hero as forces beyond these two gather to destroy the Man of Steel, beginning with a dormant Doomsday who has crossed over from the Phantom Zone! Art by: Lan Medina, Edgar Tadeo. Covers by: Ivan Reis, Joe Prado, Dan Jurgens. 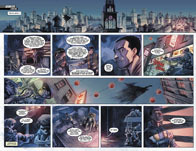 Description: A "Futures End" prelude! Spinning out of Aquaman, the King of Atlantis and his teammates find themselves targeted by an unknown foe that wants their Atlantean artifacts! Don't miss the start of this all-new series! Written by: Justin Gray, Jimmy Palmiotti. 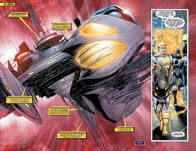 Art by: Eduardo Pansica, Julio Ferreira. Description: Batwing races Menace to attempt to save his family! But the Gotham Underground is about to boil over with anarchy, and no matter which tribe rises up from below Gotham City, Batwing will be the first target! Written by: Brian Buccellato, Francis Manapul. Covers by: Francis Manapul, MAD. 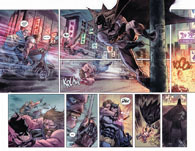 Description: A bold new direction for Detective Comics as The Flash creative team of Francis Manapul and Brian Buccelato take over the creative reins! 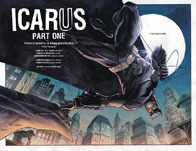 Batman finds himself knee-deep in a new mystery involving a deadly new narcotic that has hit the streets of Gotham City. Art by: Nicola Scott, Trevor Scott. Covers by: Andy Kubert, MAD. 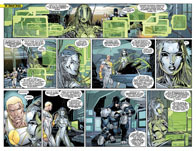 Description: When all looks lost - Green Lantern returns! Description: "Of Men And Mice" barrels toward its epic conclusion in this penultimate chapter! The secrets of the mice/men hybrids are revealed! Cindy and the man responsible for it all return to Fabletown just in time for...chaos? Spies, intrigue, murder, and more rodents than a New York City subway tunnel! Description: "The Outsiders War" Part 5! Arrow and Robert face a mob of Outsiders. It looks bad...but the cavalry is about to arrive in the form of Katana, Butcher, Magus and Kodiak! Will they be in time to save the day? Cover by: Billy Tan, MAD. Description: Hal Jordan is surrounded on the homeworld of the Khund, the bloodthirsty military wing of a cosmic alliance that's determined to crush the Green Lanterns! So why has he volunteered to fight without his ring? Art by: Walter Carzon, Horacio Ottolini. Cover by: Walter Carzon, Horacio Ottolini. Description: Daffy Duck is sure he'd give the best-ever rendition of his pal Porky's famous "Th-th-that's all, folks!" Could he be too good at it, though? We'll find out when the director gives him his big break! Art by: Freddie E. Williams. Description: Virtue's mysterious past is revealed! Plus, The Movement travels outside of Coral City for the first time to rescue their teammate Burden from his demonic brother! Art by: Jeremy P. Roberts. Cover by: Jeremy P. Roberts. Description: Final issue. A "Futures End" prelude! The original Stormwatch team returns, as this story sets up the organization's role in the future of the DC Universe! Description: Alec Holland contemplates the Sureen's offer to turn him human... but if he does accept, what happens to his almost all-powerful body? He and his warrior companion Capucine must travel to India to find the answers... and to get there, they'll need help from Vandal Savage! Description: What is Nika's ultimate destiny? And what role will William play in the survival of humankind? Can they finally be reunited before the universe unravels all around them? Vertigo's sci-fi epic reaches its mindbending conclusion. Description: "The Crack in Creation" begins! Sin Eater and his new master, the mysterious Non, are marshaling an army of these in-between souls! Their goal? To invade the world of the living and set up a new order! Guest-starring Superman and Dr. Light, who is still dead! Written by: Sean Williams, Heather Nuhfer. Cover by: Alan Quah, Jason Gorder. Description: A special Bennett Witch issue! In "1969," Grams reveals the story behind her first meeting with Stefan Salvatore - and her awakening as a force in the antiwar movement in Mystic Falls. Then, when Bonnie wasn't visiting her boyfriend in Mystic Falls, she was learning more about her family's powers...with devastating results!